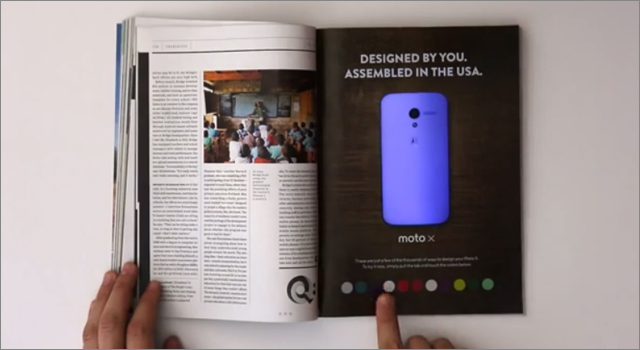 New York and Chicago area readers of Wired’s January issue will get to experience a interactive print ad promoting the Motorola Moto-X. Readers can control the 11 different colours of the phone in the ad by pressing on one of the coloured swatches lined across the bottom of the page. To create the interactivity, the ad uses polycarbonate paper that covers LED lights, which are powered by four lithium batteries and controlled by circuitry running to the colour swatches. For Facebook users, Motorola as created the Moto Match app which produces a Moto X based on the colours found in a user’s chosen timeline photo.